Thirty years ago the Windlesham Society set up a footpaths and bridleways sub-committee with the aim of producing a series of leaflets describing walks in the parish which covered all the public rights of way in Windlesham, Lightwater and Bagshot. 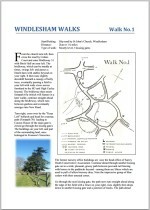 The publication costs of the 18 walks in the series were met by Windlesham Parish Council. They proved very popular with the public and were updated and re-printed over the next 15 years to take account of changes in land use, new development etc. Now the walks have again been revised by former parish councillor and retired journalist June Green, who was a member of the sub-committee, and they are being published on the parish council’s website so that they can be downloaded and enjoyed by residents. The walks are all circular and range in length from just over a mile to four and a half miles. They are illustrated with maps and colour photographs, and in addition to a clear description of the route to follow, they contain historical and other details of interest relating to the area. Tim Price, Clerk to the Windlesham Parish Council, is very pleased that the leaflets are available again. He said: “ The Windlesham Walks were always very popular and the revised leaflets have been produced to a very high standard with colour photographs. They are much more easily obtained now that they can be printed directly from the website. It would be interesting to hear from people who use them”. The first four walks are now available online and can be accessed by going to www.windleshampc.gov.uk and clicking on the “Windlesham Walks” tab on the main menu. Other walks will be added as they are completed. For further information contact Tim Price, clerk to Windlesham Parish Council, 01276 471675 or June Green, 01276 453692. Have you seen wanted man Luke Andrews? Camberley Be Entertained. Join us in The Square on Saturday 4 May 2019 for our FREE Alice in Wonderland themed day. Can you help find 12-year-old boy David Richardson, missing from Walton-on-Thames? Can you help us find wanted man Ryan Holloway?